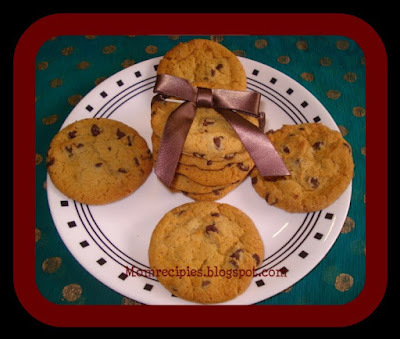 Chocolate chip cookies are easy to make and a delicious treat for anyone.This recipe produces a rich and chewy cookie . They taste awesome. Makes about 2 dozen round cookies. 1) Preheat oven to 375 degrees F (190 degrees C) with rack in center of oven. Line baking sheet with parchment paper. 2) In the large bowl beat the butter until smooth and creamy. Add the white and brown sugars and beat for 2 minutes until fluffy . Beat in eggs, one at a time, making sure to beat well after each addition. Add the vanilla essence and beat well. Everything should be mixed well. 3) In a separate bowl, sift together all purpose flour, baking soda, and salt. 4) Add the dry ingredients to the egg mixture and beat until mixed well and form a dough. 5) Stir in chocolate chips and walnuts (if using). 6) Drop dough by rounded tablespoons 2 inches apart onto the prepared baking sheet. 7) Bake about 9 - 11 minutes, or until golden brown around the edges. You may even think that the chocolate chip cookies are underdone, but they will finish cooking through out of the oven. 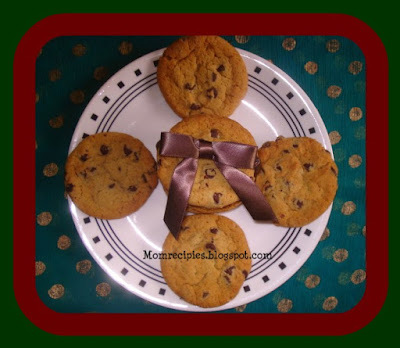 If you leave them in oven for too long, the cookies will become tough or crispy. 8) Let them cool for 2 minutes on baking sheet then with a wide spatula ,transfer cookies to wire racks to cool completely before storing. You can't beat a good home made cookie and this just looks so so good. This is so timely! This can be a nice giveaway for the coming birthday party of my friend. Wow your cookies have come out so perfect!